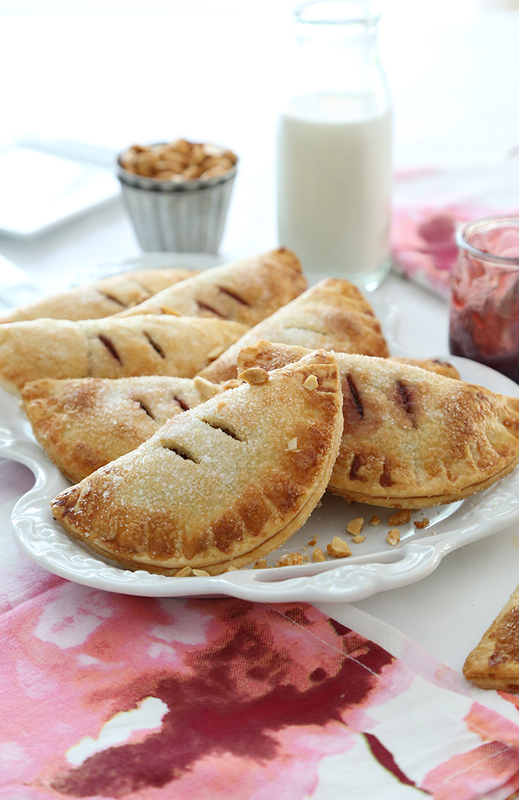 This pie crust recipe is a favorite of mine, and it comes together quickly in a food processor. No funny stuff here! Just simple ingredients with all the virtues of real butter - and nothing compares to the flavor of an all-butter pie crust! I like crunchy peanut butter for these pies, but you could also use smooth. For those who prefer natural peanut butter over the shelf-stable variety, it works well in this recipe. Go for it! My mom bought me a set of dumpling presses years ago and I'm only just now getting around to using them! 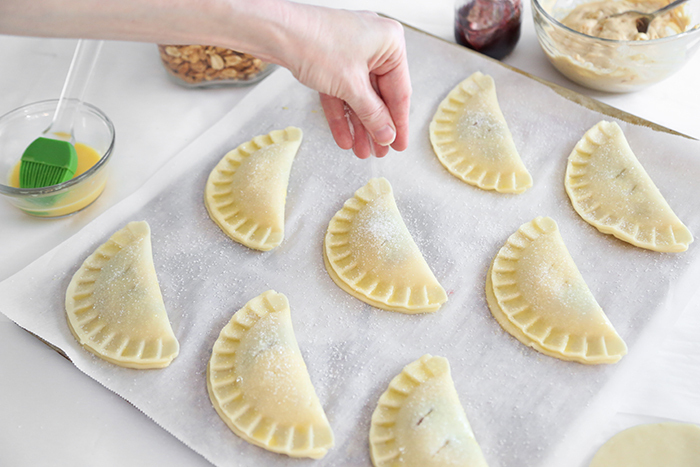 I wish I'd been using them all along for hand pies, because they make the prettiest half-moons with neatly crimped edges. A little egg wash brushed around the edges before sealing helps keep all the fillings inside the crust. Vents are cut in the tops of the pies so steam can escape. The tops of the pies get a brushing of egg wash and a sprinkling of sanding sugar. This makes them turn golden in the oven, and the sugar makes them sparkle and crunch. If you don't have a dumpling press, you can always do it the old fashioned way (which works just as well). 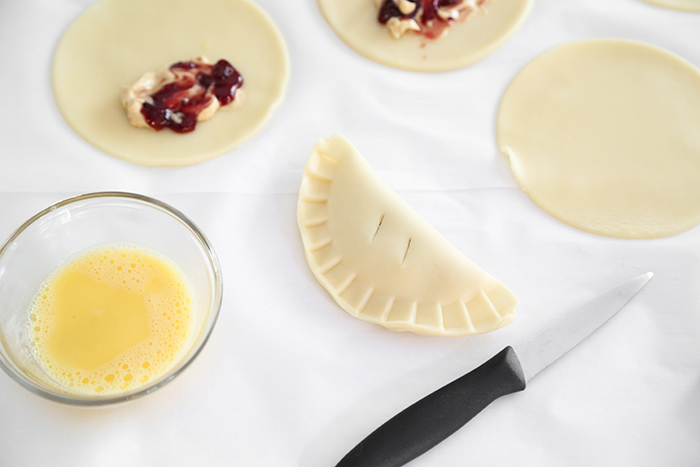 Fold the dough and crimp the edges of the pies with the tines of a fork. This recipe makes about 10 pies, but they're on the small side so expect them to go fast! 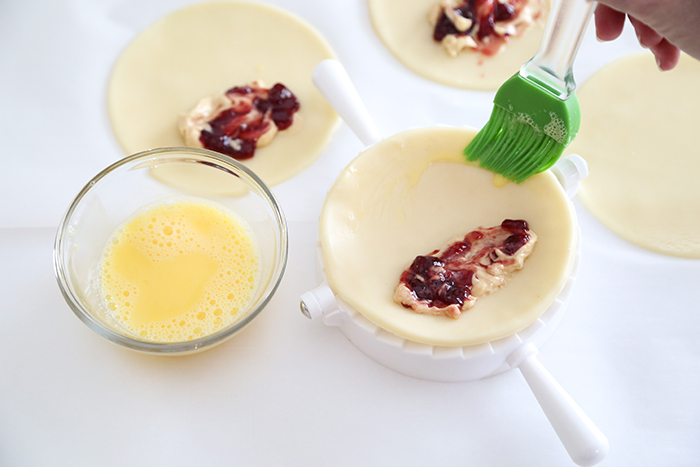 The cream cheese-peanut butter filling is the perfect accompaniment for any flavor of jelly you like, but raspberry is my current favorite so that's what's listed in the ingredients. Concord grape jelly would also be fitting for these little hand-held gems. To make pie dough, add flour, sugar and salt to bowl of food processor; pulse to combine dry ingredients. Add butter to flour mixture; process again in short bursts until butter is well-dispersed into flour. Add egg and process again in short bursts until combined. Add cold water and pulse until mixture forms a ball on one side of food processor bowl. Divide dough in half and shape each half into a disk. Cover with plastic wrap and refrigerate 1 hour. Preheat oven to 400°F. Cover large baking sheet with parchment paper. In small bowl, combine peanut butter, cream cheese and sugar; mix until smooth. Roll out pie dough on lightly floured surface to 1/4-inch thickness; cut out 10 circles, about 5-inch in diameter. 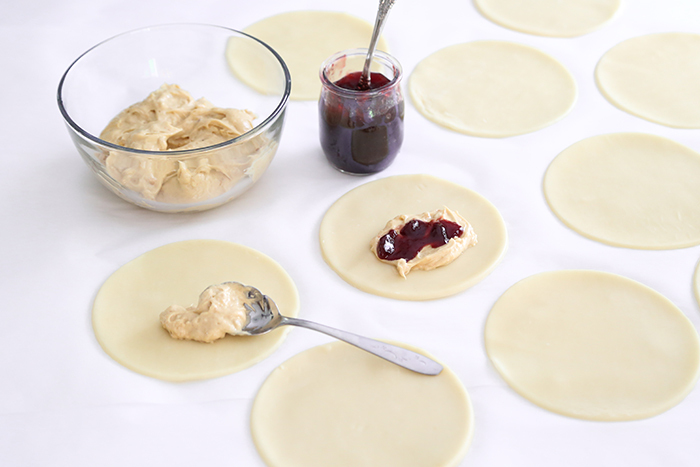 Place about 1 teaspoon peanut butter filling on each circle (on one side of the circle – not the center); top with 1 teaspoon jam. Brush egg mixture around edges of circles and fold over so that edges meet and form a half circle. Crimp edges with tines of a fork to seal. Cut two slits in top of each pie using a knife and place on prepared baking sheet. Brush tops of pies with remaining egg wash and top each with sanding sugar. Bake 18 minutes, or until golden brown. Allow pies to cool on baking sheet 5 minutes, then remove to baking rack to cool completely. Serve with napkins – no plates required! These really are the perfect back-to-school snack. And they're homemade fresh, so they must be delicious! Thanks, Heather. Can't wait to try these. These look incredible! Raspberry jam is also my preference for a peanut butter & jelly combo. Quick question, if I wanted to reduce the sweetness in the crust (say if I used one tablespoon instead of two), do you have any tips on how adjust the recipe accordinly? Will I need to replace the reduced sugar with anything else? I know this is an older recipe but maybe you get notified about comments. 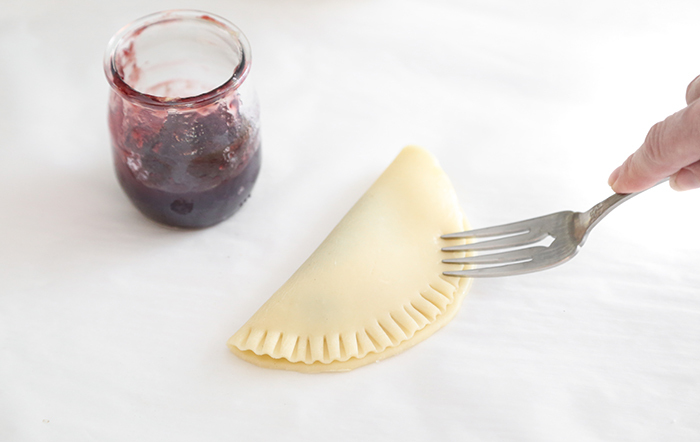 May I ask what size "dumpling press" you used for your 5" hand pie? Did you ever post further recipes for maybe fruit etc. pies? Thank you. Hi Micki! I'm happy to answer your questions! 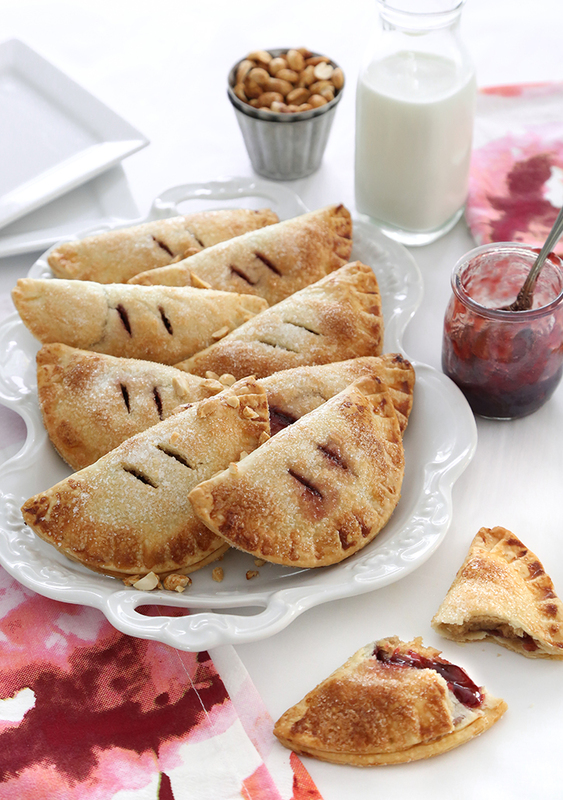 I have not yet ventured into other pie fillings for these hand pies. My mom recently made a pineapple version that is so tasty, and I can't wait to try it for myself! I hope to share the recipe in the coming months. Thank you Heather. I ordered the 3-set you have and can't wait for them to arrive and try these tasty looking "pies". Pineapple pie sounds very intriguing.